When most people think about food and weather they have traumatizing flashbacks of their parents shoving all of the food in the fridge into their mouths because the power went out from an approaching hurricane. This has happened to me on several occasions. Weather can affect not only what type of food we are buying before a superstorm but also what food we will eat in a restaurant on a sunny day. This is an example of weather directly affecting our food in a supermarket. In my opinion weather most definitely affects which restaurant I eat at and what I choose off of the menu. If it’s raining out most people would go for something warm like soup or coffee, while if it’s hot outside people will choose a cold item off of the menu. Whether we realize it or not, the weather outside is directly affecting our choice of food. In this study that I found online, scientists tested the effect of 17 different types of weather with the demand for certain food products in a restaurant. The null hypothesis in this experiment was that weather does not affect the food choice of customers while dining. The alternative hypothesis in this experiment was that weather does affect the food choice of customers while dining. To test these hypothesis the scientists created two sets of data. One set was based on a restaurant which the data was divided into breakfast, lunch and dinner. The second step for the first set was dividing the items on the menu based on if they were cold or hot. The second set involved the weather variables that could be experienced. The scientists recorded 22 different types of weather. Both of the data for each data set were collected for 50 weeks on a daily basis. The two data tables were emerged for the final analysis of the experiment. The results for the effect of weather factor on different types of items on the menu were that the weather directly affected the individual sales on certain items. For example there was a dramatic increase in the purchase of Belgium Waffles on the data table when the weather was changed. The results for the effect of weather factor on the restaurant as a whole were that weather directly affected the total sales of the restaurant. Both of these variables proved the alternative hypothesis to be correct. Some limitations of the experiment was that the restaurant was only from the south east region of the United States. To further the experiment it would need to have multiple cases of different restaurants that experience different weather variables than the south east. Another limitation was that the data table only called for weekly analysis rather than hourly. To further the experiment it could use hourly analysis to become more distinct on the immediate effect of weather change. This entry was posted in Uncategorized on October 20, 2016 by Grace Anne Walker. This was an interesting topic for me to read about. I am from southern California where the climate is an average of 75 all year round. Everyone has iced coffee throughout the year. Everyone orders soup even though it doesn’t fit the temperature. As a freshman, I’m excited to see how the climate has an affect on what people order in an environment that actually experiences temperature change. This is a good topic to write about. 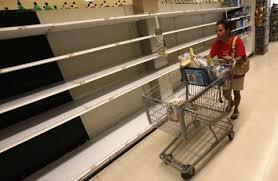 The first thing I thought was people running to the store to buy milk, water, and bread when a bad storm is coming. I like how you put in the null hypothesis and the alternative hypothesis to the study. You can definity see a trend in supermarket food buying around storms, and your blog helped prove that theory.